Wal-Mart is rolling out a feature that will enable its website to show shoppers more products that they may like, based on previous purchases. NEW YORK – Wal-Mart, in its latest bid to compete with nemesis Amazon.com, is rebuilding its website to further personalize the online shopping experience of each customer. Wal-Mart is rolling out a feature that will enable its website to show shoppers more products that they may like, based on previous purchases. It will also customize Wal-Mart’s home page for each shopper based on the customer’s location, local weather and the customer’s search and purchase history. So if a new mom just bought a stroller or crib on Walmart.com, the revamped website might recommend diapers and car seats, too. And if someone who lives in Dallas searches the website for sports jerseys, Walmart.com could suggest Rangers or Dallas Cowboy gear. The increased personalization is part of a series of changes to improve the online shopping experience of its customers that are rolling out now and over the next few months. The retailer is looking to boost its business online at a time when its U.S. discount division has seen disappointing sales. Wal-Mart Stores Inc.’s e-commerce sales increased by 30 percent to over $10 billion in its fiscal year that ended Jan. 31. By comparison, Wal-Mart’s U.S. discount division has had five straight quarters of sales declines at stores opened at least a year. Wal-Mart sees big growth opportunity in the online business: Online sales still are only a fraction of the $473 billion Wal-Mart generated in overall annual revenue, dwarfed by Amazon’s $60.9 billion in annual sales. The move to personalize websites for shoppers has become a top priority for traditional brick-and-mortar retailers like Wal-Mart as they play catch up with Amazon.com, the online king that pioneered customizing content for shoppers. Retailers increasingly are trying to use their reams of customer data they get from mobile devices and computers to personalize their websites and ultimately, boost sales. Other retailers, including home-improvement chain Home Depot and office-supplies retailer Staples, have been working to personalize the online shopping experience. In fact, a quarter of customers who visit Home Depot’s home page see product recommendations that are based on recent purchase or browser history, according to the company. Retailers have seen benefits in personalizing their websites for customers, as well as other efforts to improve the online shopping experience. Overall, Forrester Research analyst Sucharita Mulpuru said that changes in customization can help lift a retailer’s online sales in the mid-single digits. Wal-Mart said that customers have responded well to improvements it has made to its website in the past two years, including quadrupling the assortment of items it offers online to 8 million. For example, when Wal-Mart updated its search tool, it saw a 20 percent increase in shoppers completing a purchase after searching for a product using the new search engine. 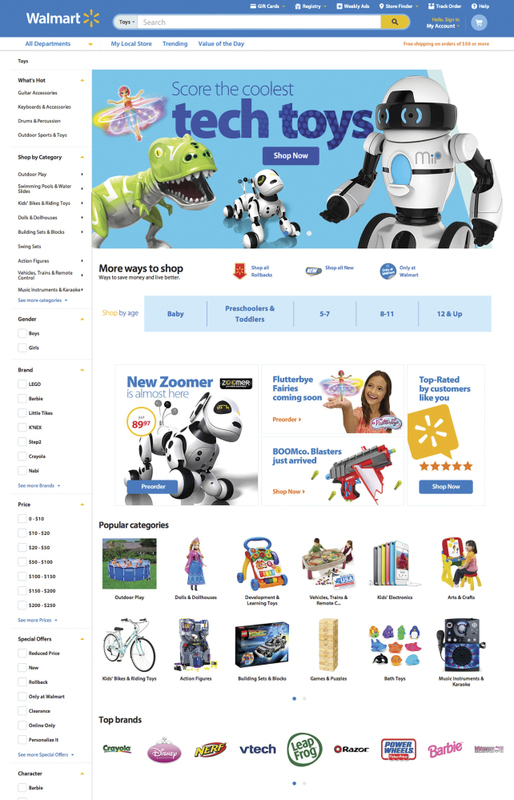 Among the other changes, Wal-Mart has redesigned the site to cater to tablets as well as other devices. That means that the content and images are now adjusted to the size of the screen. So shoppers will see more columns of products on bigger screens. Shoppers will see other improvements. Walmart.com will be testing a quicker online checkout process over the next couple of months. That means customers will view one page instead of six before clicking on the “buy” button. And the company will be able to update Web pages within minutes instead of days.